Thailand and Laos yesterday agreed to underscore their partnership by boosting and developing border trade, which is expected to reach US$8.16 billion over the next three years. 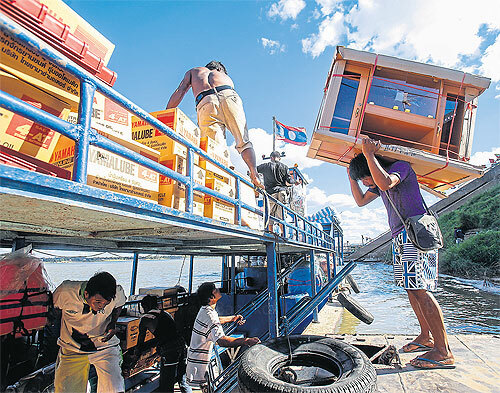 According to Commerce Minister Chatchai Sarikulya, Thailand and Laos agreed to set up a joint border trade committee as a key mechanism to drive and supervise the economic links of key border towns, mainly through Nong Khai-Vientiane, Chiang Khong-Bokeo, Nakhon Phanom-Khammouan and Mukdahan-Savannakhet. The pilot project will focus first on Mukdahan-Savannakhet, Gen Chatchai said after attending the sixth joint cooperation meeting with Khemmani Pholsena, the Lao minister of industry and commerce. Last July, the National Council for Peace and Order designated Mukdahan and several other provinces (including Tak, Songkhla, Sa Kaeo and Trat) to receive special economic zones. The SEZs will span 10 districts and 36 tambons with a combined area of 2,932 square kilometres. The SEZ panel chaired by Prime Minister Prayut Chan-o-cha recently agreed to include Nong Khai in the first phase of SEZ development, in addition to the other five locations already approved. Mae Sot in Tak will probably be the first SEZ developed this year. Gen Chatchai said the governments also agreed to promote private-sector activity in the two countries by setting up centres for shopping, production, transport, logistics, tourism, health care and education along the border. National discussion mechanisms for the public and private sectors will be established both locally and nationally to pave the way for trade talks and to boost border trade. Ms Khemmani said Laos would tackle the transport issue by allowing easier movement of goods to southern China along Highway R3A, a key route linking Xishuangbanna to Chiang Khong district in Chiang Rai via Laos. Laos also promised to handle existing obstacles hindering imports and exports between the two countries. Last year, Thailand was Laos’s biggest trade partner, while Laos ranked No.21 among Thailand’s global trade partners and No.7 in Asean after Malaysia, Singapore, Indonesia, Vietnam, the Philippines and Myanmar. During the 2009-13 period, bilateral trade between Thailand and Laos averaged $3.76 billion a year, with annual growth averaging 35.8%. In 2014, bilateral trade reached $5.44 billion, up 6.3% from the year before, with exports of $4.03 billion, up 7.3% from 2013. Imports last year totalled $1.41 billion, up 3.7%.